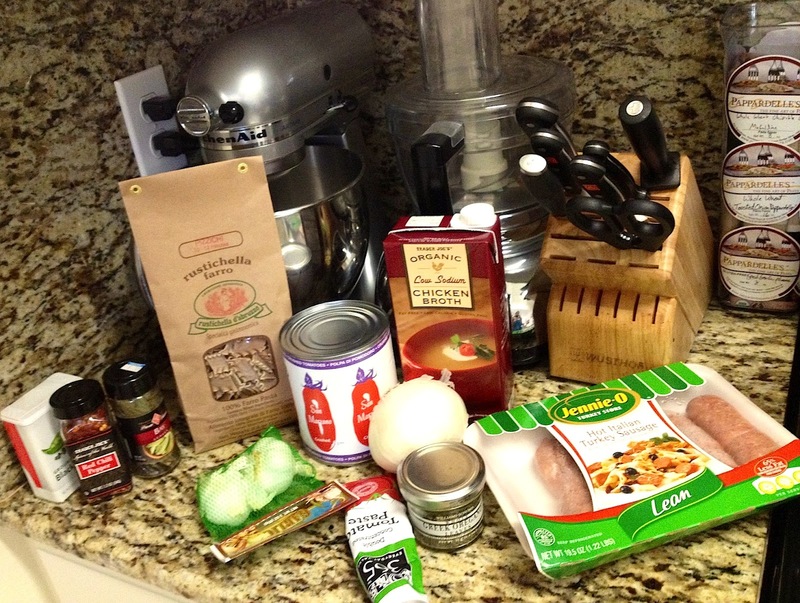 A recent trip to Bay Cities Italian Deli in Santa Monica perfected my Lasagna Soup. Bay Cities is an Italian food lover’s dream. I visited intending to browse and left with six different types of pasta. Bay Cities has every cut and grain imaginable, putting any grocery store variety to shame. 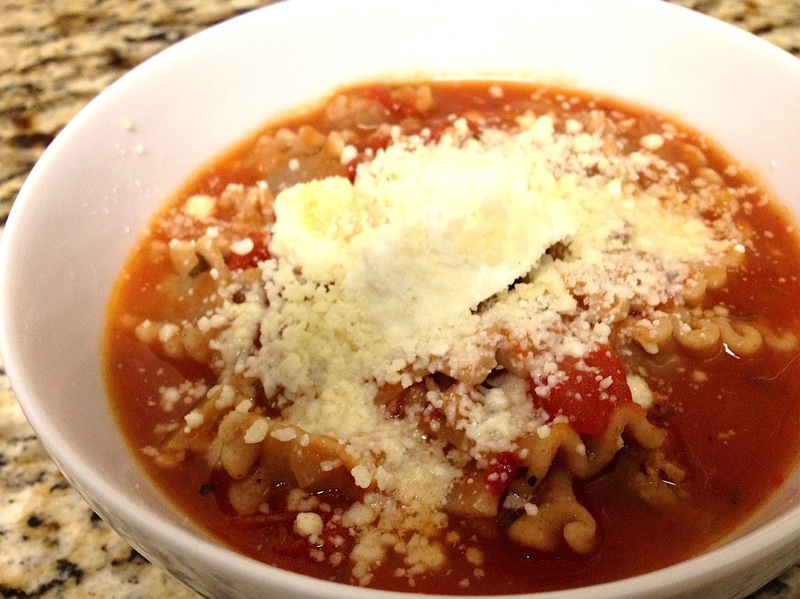 Rustichella d’Abruzzo Farro Pizzichi caught my attention as the perfect pasta for Lasagna Soup. I love lasagna, and crave the flavor but rarely have the patience to build the layers and bake the dish. 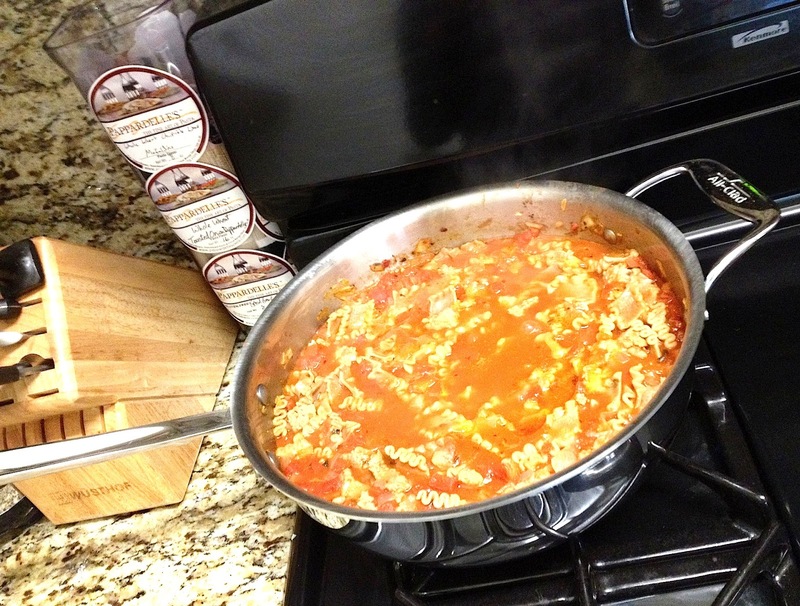 Thick lasagna soup gives great lasagna flavor in half the amount of time. I’ve tried making lasagna soup by breaking apart large lasagna noodles, and it just didn’t work. Using penne or fusilli makes for a tasty soup, but doesn’t resemble lasagna. Pizzichi looks like a baby lasagna sheet, and the farro variation is nutty and nutritious. Farro pasta is more delicate, so do not stir the pasta for the first two minutes after dropping it in the boiling water. Expect more Bay Cities pasta recipes in the next few weeks. Training for a race + this new find on Lincoln Blvd = lots of hearty pasta meals! 1/2 pound pasta, Farro Pasta Pizzichi by Rustichella d’Abruzzo is perfect! Heat the olive oil in a large sauce pan over medium heat. Add the sausage and cook until lightly browned, about 10 minutes, breaking it apart as you go. Add the onion and saute until tender, about 5-7 minutes. Add the garlic, red pepper flake and oregano and saute until fragrant, about a minute. Add the tomato paste, and cook for another minute. Add the chicken broth, tomatoes, oregano, bay leaf, salt and pepper, bring to a boil, reduce the heat and simmer for 30 minutes. Add the pasta and cook until al dente, about 8 minutes and remove from heat. Top with parmesan, goat’s cheese, and/or basil.